I turned 33 on August 9th, and it must be a sign of maturity that I'm only getting around to reflecting on the occasion now. That's okay - age, after all, is relative. Ever since I turned 31, I've been doing a yearly time capsule to capture the moment and the year as they are in this moment. You can read 31 here, 32 here, and 33 below. Thirty-three is a new career, again. It's going to an office five days a week and hoping all the studies that claim that sitting in a chair all day will kill me are wrong. Thirty-three is using my skills as a writer and a digital native to help other businesses grow. It's wondering sometimes if this particular career is enough, if any job is enough, if jobs are supposed to be enough, if enough even exists. Thirty-three is a literary career - the one that I care about most, the one that would most certainly be enough - teetering on the edge. It's eleven revisions and an agent and the maddeningly slow game of waiting for something to happen. Thirty-three is letting go of expectations and control and throwing myself into a new project, the first draft of another novel, because it doesn't matter what happens with the first one. The only thing that matters is that I keep writing. Thirty-three is Wilmington, for real this time. Not as a student, not as a visitor, but as someone who lives here and really, truly likes it. Thirty-three is less social, but the days and nights out are always worth it, always needed, always enjoyed. Thirty-three is missing more people than ever before, but realizing this is an ongoing trend - it just means I'm always finding new people to love. 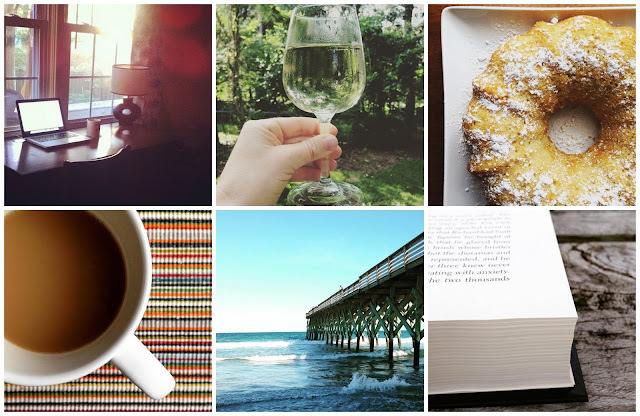 Thirty-three is breweries, book clubs, beaches, and backyard parties. Thirty-three is peaceful. Thirty-three is thirteen years and counting with Nathan, a relationship that has outlasted nearly everything else in my life and continues to evolve. It's comfort and safety and strength, and the knowledge that no matter what, we'll figure it out and be okay. It's dreaming about the future in our spare time, making plans but waiting to see what will happen next. Thirty-three is ongoing relief that the biological clock has yet to tick, that the plan to remain child-free still feels right. Thirty-three is gentler on my body - less marathons, more yoga. Thirty-three is feeling stiff in the mornings and sleeping hard at night. Thirty-three is eggs from my chickens, honey from my bees, basil from my garden. Thirty-three is watching Seamus get older - eleven this year! - with wonder and fear about how much longer we will share our life with him. Thirty-three is gratitude for Calvin, only five, who is still fat and sweet and just beginning to go gray. Thirty-three is wine and beer on the back deck, too much and too often and not apologizing for it. Thirty-three is reading books like I did when I was thirteen - widely and enthusiastically, but not guilelessly. It's understanding the power of books in a new way, and making a conscious effort to read books by people who do not look or live like me. It's becoming an active member of the wider literary world, and supporting the work of other writers I admire. Thirty-three is watching as my friends and colleagues begin to find success, wondering who will be next, hoping it will be me. Thirty-three is envy and joy, twin emotions in equal measure. Thirty-three is hope, and happiness, and health, and heart. It's good to be thirty-three.